TRUMBULL, Conn. (CNS) — Bridgeport’s new bishop used a famous image of his hometown — the Brooklyn Bridge — to describe how, like a physical bridge, a “spiritual bridge” pulls communities together and draws Catholics closer to God, the Gospels and one another as members of the body of Christ. “On my first day of my ministry in your midst, I ask you to join with me hand in hand, heart to heart, to become builders of spiritual bridges with the help and grace of the Lord and his Holy Spirit,” said Bishop Frank J. Caggiano in a homily during his installation Mass Sept. 19 at St. Theresa Church in Trumbull. About 1,200 people packed the church for the Mass when the former auxiliary bishop of Brooklyn, N.Y., officially succeeded Archbishop William E. Lori, now archbishop of Baltimore, as the fifth bishop of Bridgeport. In addition to Archbishop Lori, other prelates at the installation included New York Cardinal Timothy M. Dolan; Cardinal Edward M. Egan, New York’s retired archbishop; Archbishop Carlo Maria Vigano, apostolic nuncio to the United States; and Archbishop Henry J. Mansell of Hartford, who was the principal celebrant of the Mass. The Brooklyn Bridge is the “iconic symbol of the borough of my birth,” Bishop Caggiano said as he began his homily. “A marvel of engineering,” he said, the bridge was “the largest steel suspension bridge in all the world when it was completed, opening “with great fanfare” May 24, 1883. “Bridges unite, they open opportunity, they can even transform human life,” he added. Bridgeport residents “are no strangers to power of bridge building,” Bishop Caggiano continued. The city and diocese are named for the “first drawbridge built over the Pequonnock River,” he noted, adding to laughter from the congregation that he did his “homework” about his new home. That bridge allowed Bridgeport “to grow and prosper for decades and upon decades,” he said, adding that like physical bridges, spiritual bridges have transformative power. “(The) very center of mission the Lord himself has given to you and to me has much to do about strengthening and building spiritual bridges,” Bishop Caggiano said. 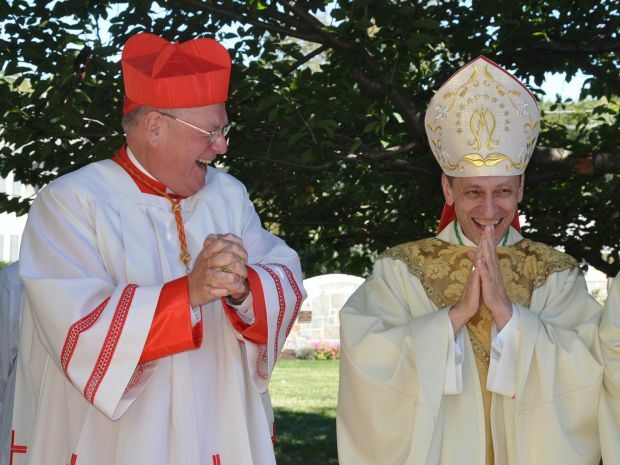 “We have a special place in our hearts for every single one of you, and we pledge to all of you this day to listen to your needs, to harness your energy, your enthusiasm, your joyful optimism, so that every young person who is searching or struggling in life … looking for hope and joy will find it here in the Catholic community of faith,” Bishop Caggiano said. He urged all Catholics to invite them “home” and “not be afraid to listen to their concerns, to offer them anew an invitation to come and to join us in worship of the Lord — the time for them to come home is now,” he said. The challenge ahead for Catholics and the church at large is great, the bishop said. But “you and I will face (challenges) together as sisters and brothers,” he said.